Stock, situated in the Trump Hotel, is a restaurant you have high hopes for. I’d imagine it to be plated in gold, filled with Italian suit clad men and overall be an ostentatious affair. So, upon arriving on the 31st floor, I was a little surprised to be lead into a dining room that was more Old Hollywood glamour than gilded royalty. With soaring ceilings and a classic white and black motif, Stock is contemporary and comfortable. 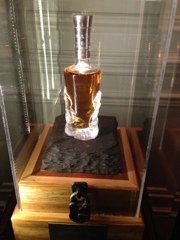 Of course, there are still some luxurious touches such as foldout purse stools and a 40-year old Bowmore scotch (approximately a $5K value) encased at the entrance. Having heard the restaurant is known for over-priced mediocre meals, I’ve never had the urge to visit the place and and waste my hard earned money. After all, I don’t have a Bay Street expense account to back my culinerary outings. So, when my friend told me about Stock’s summer supper menu (2 courses for $39 or 3 courses for $49), it seemed like an opportune time to visit. 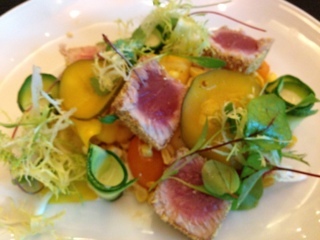 The highlight of the night was the seared yellowfin tuna appetizer. Encrusted in corn meal, the tuna was beautifully seared to retain the raw pinkness in the middle. The vegetables making up the salad just screamed summer with sweet corn kernels, zucchini ribbons and various herbs and sprouts. The strange touch was the sweet butter pickles garnish – it wouldn’t have been my pick but one friend enjoyed them. Most importantly, I loved that they stayed away from the tasteless tomato vinaigrette that seems to be gracing so many summer menus. Stock’s dressing, a zingy and spicy lemon jalapeno aioli, was piped into the zucchini tubes so that you could customize the amount of dressing that goes into your salad. When the harissa (a spicy North African chilli paste) roasted shrimp arrived, the dish was equally colourful and visually appealing. Sadly, unlike the tuna, the shrimp were overdone and bordering on rubbery, despite its large size. A salad of crispy green beans, sweet grape tomatoes, corn, roasted red peppers and dandelion accompanied the dish but was a bit bland as there was no dressing. Overall, a disappointing dish after such a delicious start. My friend’s chicken breast was the tastier option. Cooked sous-vide style, the chicken was very tender as you’d expect. 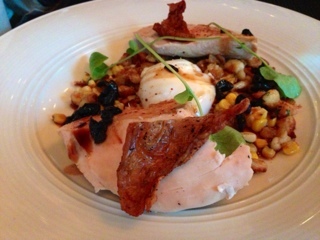 A generous portion of toasted späetzle accompanied the poultry with chorizo and corn mixed throughout. The sous-vide poached egg was just heavenly when the creamy yolk was mixed into the crispy bits of späetzle and chorizo. An olive jus flavoured the entire dish; unfortunately, not one of my favourite flavours which was why I didn’t order the chicken to begin with. But, the olive taste wasn’t too overpowering, which made me have Orderer’s remorse. What Stock does right is their service. Everyone we encountered that night was efficient, friendly (in a professional manner) and exceptionally attentive – my water and wine never dipped below a quarter full and after polishing off the basket of warm bread, a second arrived without even being requested. But, of course that’s what you’d expect from a restaurant situated in a luxury hotel. 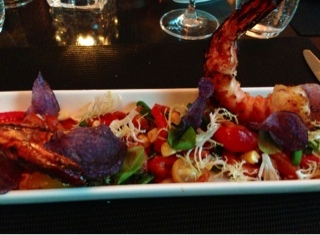 However, the food still needs improvement to reach equality with Shangri-La and the Four Season’s offerings. After all, a good starter and mediocre main shouldn’t be tolerated by a hard-hitting boss like Trump. *Mark was increased by 0.5 due to the exceptional service.